The push for more housing and competition for dwindling sites is forcing developers to be more creative and look upwards for potential opportunities. Building on city rooftops could grow in popularity, especially if the government holds good on its recent promise to relax planning rules. But Haydon Murton, building consultancy Partner at SHW, says it’s important for developers and landlords to be aware of the ups and downs of this approach which can prove challenging. He is project managing the development of 15 new penthouse apartments on 15 Art Deco blocks in London’s Chiswick Village and highlights some of the key practical factors to be aware of. Weigh up your options: developer-led or do it yourself? Developers commonly approach landlords or head lessees directly with offers to purchase the right to develop roof space. From experience, this can result in many problems. While it might seem attractive, with funds being received earlier, it is generally more profitable for the landlord/head lessee to engage a design team, procure the project and carry out the construction phase of the project themself. Planning: Planning consent is required for the development work and this can be onerous and time-consuming. It took four years to secure consent for Chiswick Village. However, a relaxation of planning policies, possibly as an extension of permitted development rights, would lessen this bureaucratic barrier. Keeping the neighbours happy: during construction, there is likely to be disruption to other occupants which will require careful management and sensitive liaison. Party Wall Notices need to be served on adjoining owners - at Chiswick Village, 58 must be served. Going up: services such as lift installations, new utility supplies and drainage will add to service charge costs and possible future maintenance requirements. In addition, scaffolding may be objected to by residents which could lead to costly licences, delays and costs. At Chiswick Village, this is being largely avoided with the careful design of cantilevered scaffold at roof level and sequencing of works. Raising standards: a new development may also be a trigger for works within the whole property. 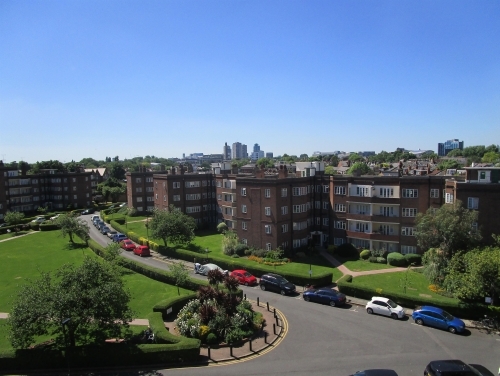 Chiswick Village is an example whereby 1930s unsafe water tanks are to be replaced by the developer, resulting in improved water pressure and accessibility. It might be opportunistic to upgrade other areas such as out-of-date fire doors. Spreading the cost: reapportionment of leaseholders’ service charge contributions will generally result in all the leaseholders having reduced contributions and maintenance obligations. For example, at Chiswick Village, the new penthouse development will avoid the cost of replacing the old and worn roof coverings, budgeted at over £1 million. As part of the scheme, the developer is providing new roof coverings with a 20-year guarantee. Savings to leaseholders can be considerable. And finally: VAT status may be zero rated for penthouse developments as they should be classified as new building thus benefiting from VAT recovery. Having the right team in place to guide property owners through this process will remove a lot of the headaches. With further help from the government in the shape of a more lenient planning regime, we can expect to see a proliferation of schemes like Chiswick Village rising above the rooftops.